What are Oidz? Oidz are also known as Magnetic Sizzlers, Powerbuzz Magnets, AsterOidz and a few other names. This prop is basically 2 very strong oblong magnets that create the ‘oidz noize’ when they collide in mid-air! Oidz are made from a naturally occurring metal called hematite (which is a type of Iron Oxide) which is highly polished and magnetised. I first saw this product on a market stall and simply had to buy a load to use in my Circus Skills Workshops! The magnets are so powerful that there are plenty of other fun uses for them such as placing one on top of the table and moving it around with the other one below the table! Basic Toss Place the oidz in the palm of your hand, so that they are close to each other but not touching. Toss the oidz gently in the air, and watch them collide together, create the oidz noize and spin! Try some low throws from hand to hand, and then try some high throws. How long can you make the oidz noise for? 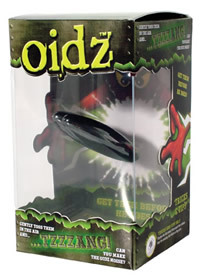 Try throwing with the oidz further apart, or even start with one oidz magnet in each hand and throw them so they collide! Each of these little experiments will product different noises for different lengths of time. Sticky Hand Hold your hand out, palm down, with your fingers stretched out. Place an oidz magnet on top of your fingers, and the other oidz can be placed underneath the fingers and will be held in place by the magnet on top! Tracing Place one Oidz on a table, and place the other oidz directly underneath the table . You can move the oidz on top of the table by moving the one underneath! You could make a little oidz assault course, or even put the oidz in a small box or polystyrene cup, so that people can’t see the magnet and they will think that you are performing magic! Flutter Place both oidz on a smooth flat surface. Put the oidz end to end so that they are touching lightly (you can use your thumb and forefinger to do this). Release both oidz at the same time, and they should make a rather pleasant noise and resemble briefly the shape of a butterfly’s wings! If you try this trick out on different surfaces, you will get a whole range of different noises! Attraction Place the oidz on a flat surface a little apart, and release. They should slowly work their way to each other and collide! Now increase the distance. How far apart can you start these magnets so that they still come together? Pendulum and Balance Tricks Try balancing one oidz below the other one in a pendulum motion. This can be quite difficult! You can also try holding an oidz magnet above the other one to keep it upright and balanced on a flat surface. Coin Sculpture You can attach coins to the magnet and make some cool sculptures! If the oidz does break, be very careful of sharp edges. Pick it up carefully and put it in the bin. If your oidz get dirty, then clean them with a damp cloth. To maximise their magnetic effect, then clean regularly, but always make sure they are dry before continuing play! To keep your storage media in good shape (computer equipment, mobile phones, credit cards, music and video tapes), keep the oidz away! These are very powerful magnets and can wipe the memory off these items! Do not use this product if you have a pacemaker or in close proximity of anyone who does. The oidz are small, and therefore a choking hazard for under 3yr olds especially. Just be careful where you leave them lying around!